My mom and her friend have been bringing me free food. I don’t like fresh figs but I love them dried. Fresh figs are really expensive and I haven’t had access to any free ones to experiment with until now. So I was excited to haul my dehydrator out of the shed. 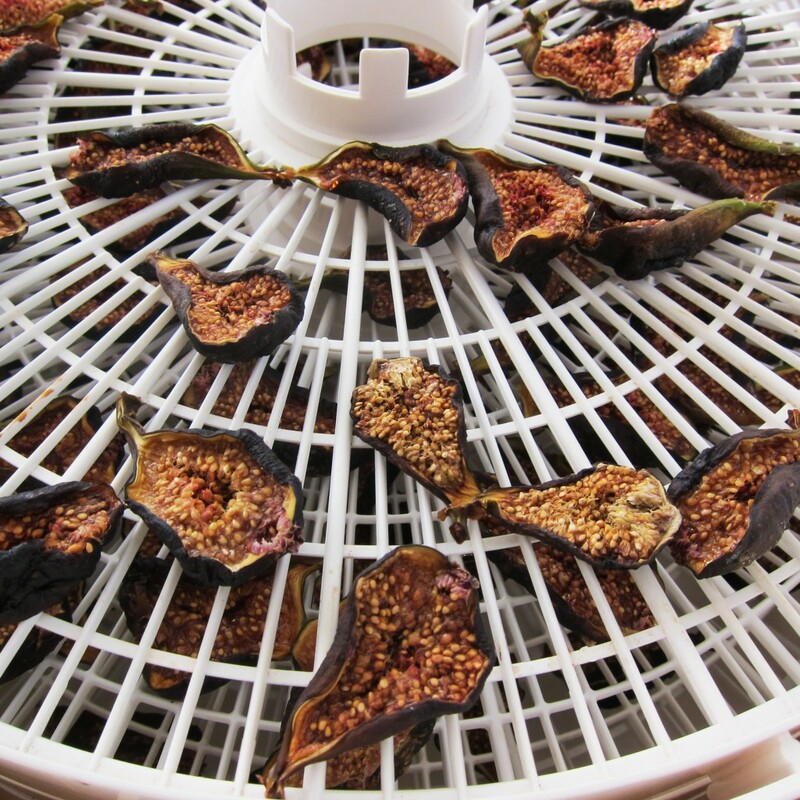 First thing I discovered is that whole figs don’t fit in my dehydrator so I had to cut them in half. Second thing I discovered is that figs take a lot less time to dry than I thought. I over-dried mine. They are now as hard as tree bark. Ooops. I wish I could get my hands on more to do a second trial with but I may have to wait until next year. I plan to soak these before using them. 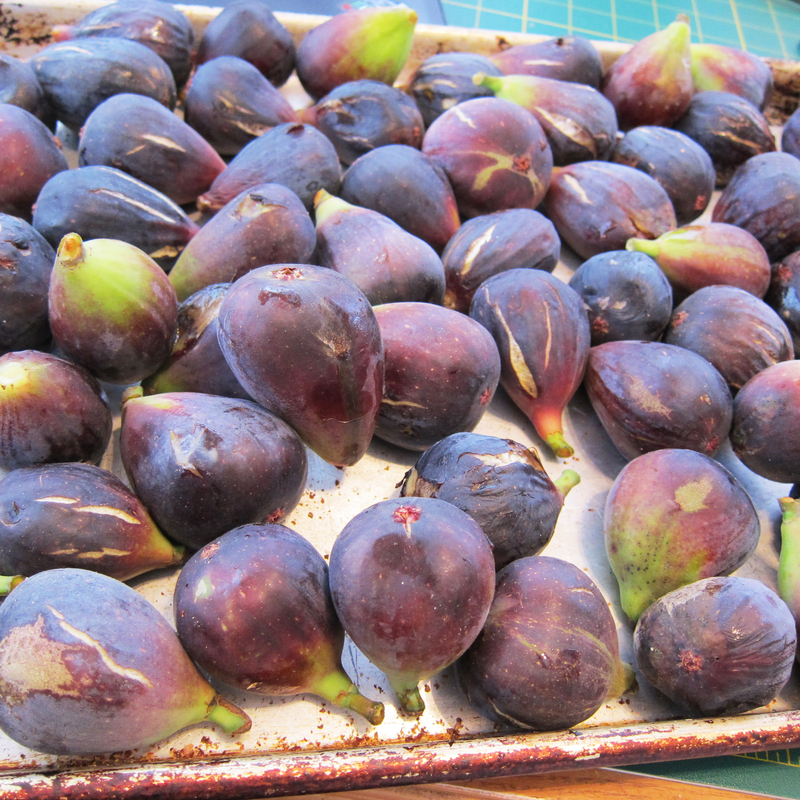 I think I’ll make some fig bars with them at some point. I am still shamefully lagging on my olive project. Between big transitions at work that are requiring a lot of extra attention and all the stuff going on around the house – and my kitchen always being dirty – I have yet to get my olives in their second (stronger) brine. The top of the brine has some mold growing on it. 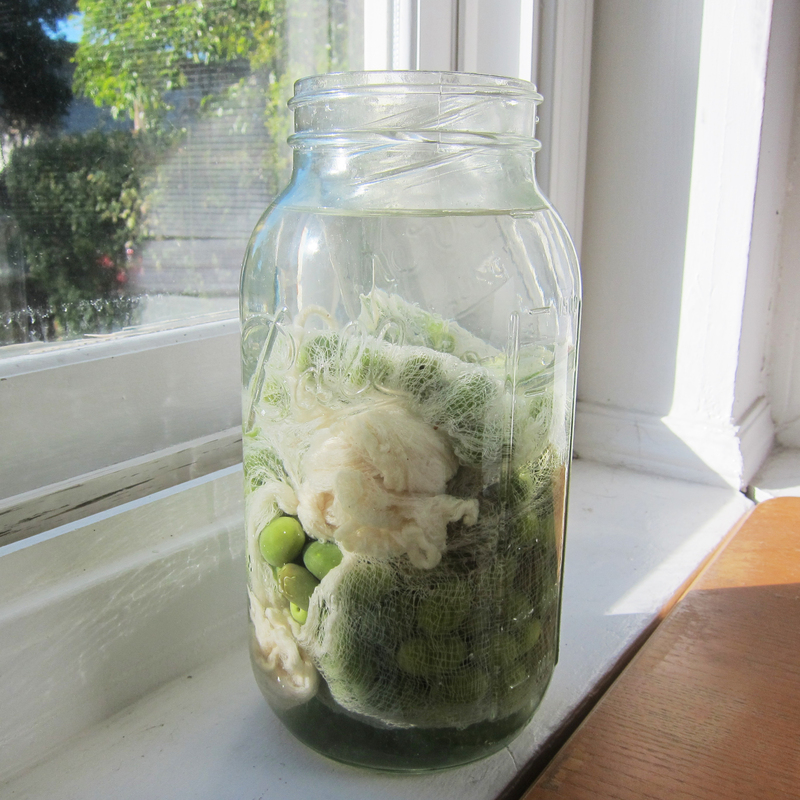 Having experimented a little with fermenting things and reading all about it – I’m not worried about it. But I do want to get to the next step. My friend Sharon who is learning to cure olives with me already has had hers in the second brined for two weeks with flavorings. I got to try some at her house the other day and I’m pleased to report that they were really good! 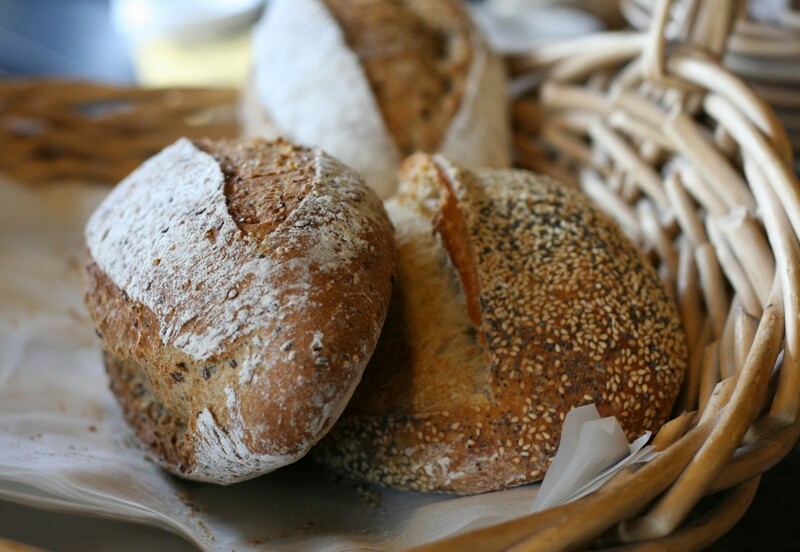 I want mine to be saltier than hers are – but they had a really nice flavor and the texture was perfect. So this method of curing can definitely get you good results. We’ll see how mine come out in another few weeks I guess. 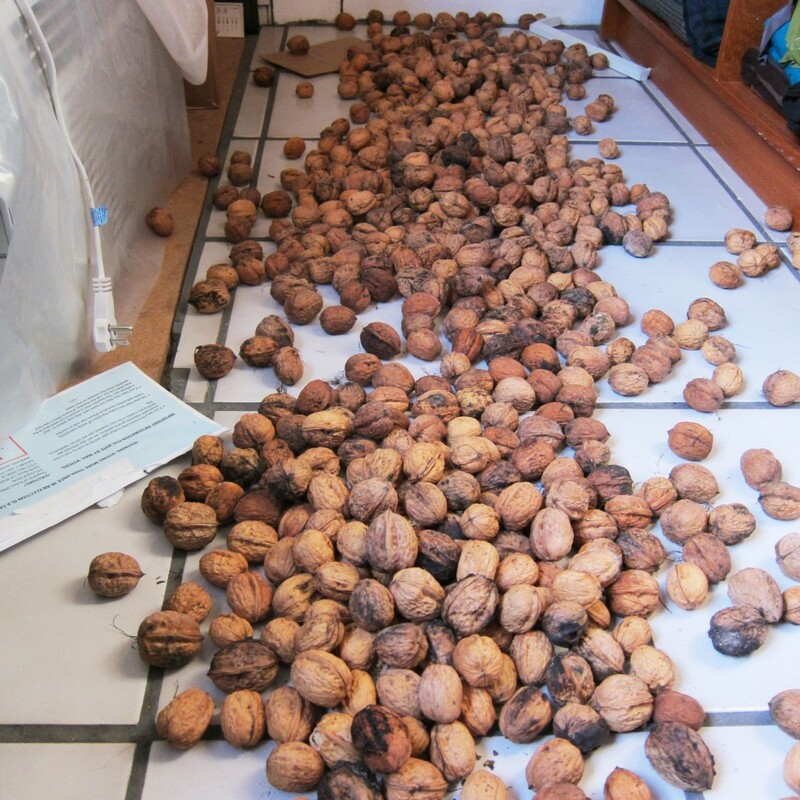 Walnut season is done. DONE. And I felt sad about it the way all you strange sun loving people get sad when summer is over and the air changes. 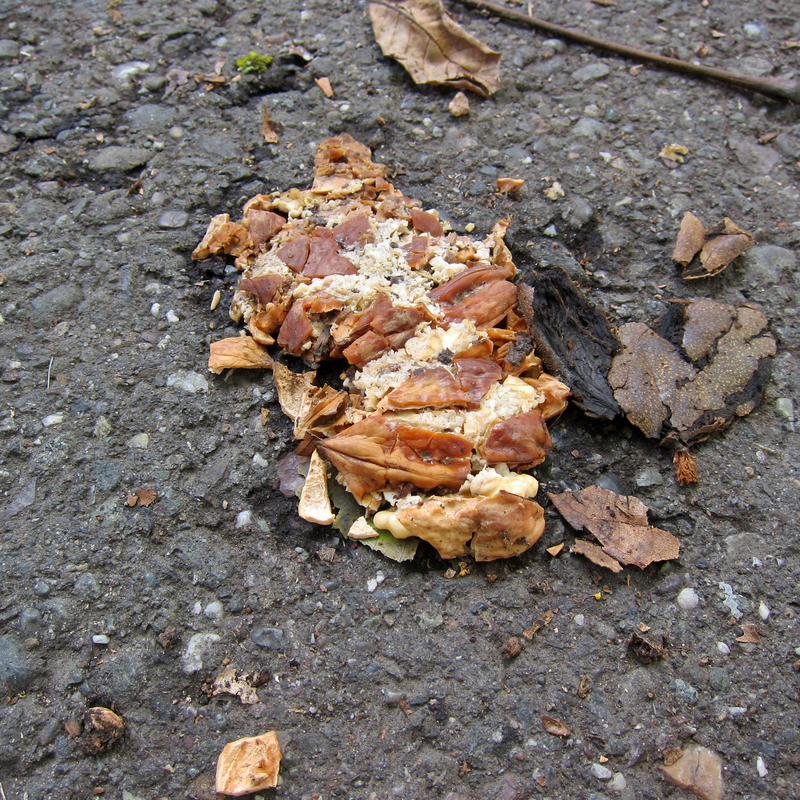 Two weeks is as long as walnuts were dropping. I foraged a total of 15 lbs and 1 little oz of them. I’m really happy to say that my mom’s friend who brought me figs also brought me a big bag of walnuts! So now I have a more respectable haul. 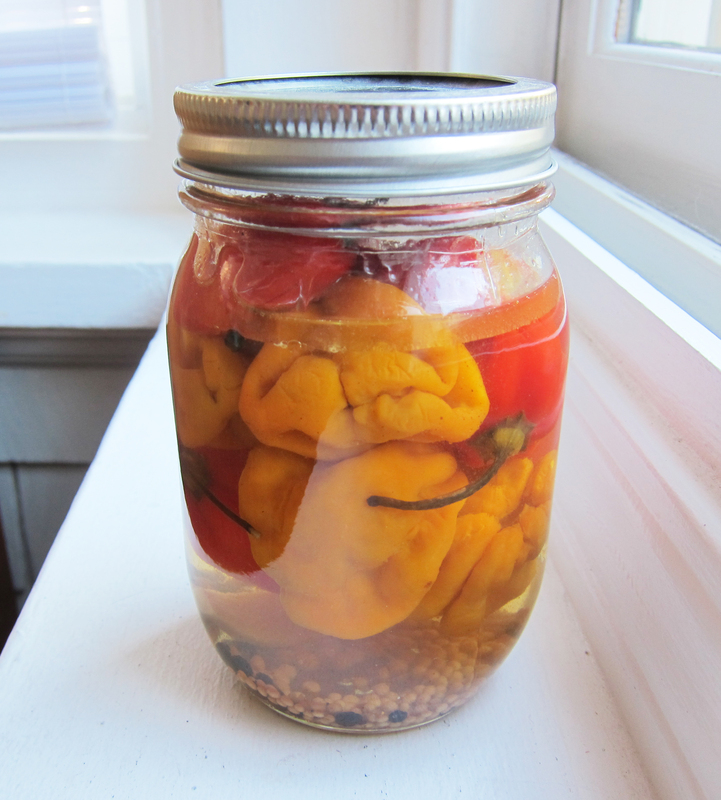 Here’s the jar of pickled habanero peppers that I’ll be giving to my sister’s close friend Emily. I’ve known Emily for a long time and now she’s a grown lady with a husband and two kids. She and her husband like super hot peppers. 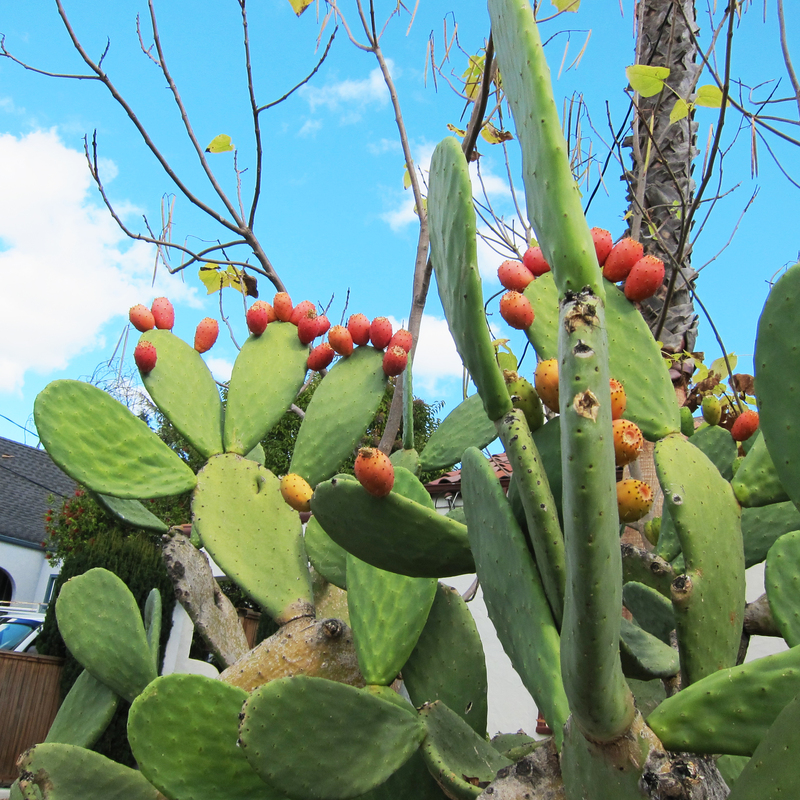 I don’t but I couldn’t resist pickling some of these because of their beauty. I’m trying to menu plan now. I’m not doing a very good job of it. Here’s what I plan to make during the following week. Stuffed pasillo peppers – stuffed with seasoned tofu and baked in a cashew cream sauce served with Mexican brown rice. Baked potatoes. What? You have to have something easy. Salad(s) with apples and walnuts, feta, and dried cranberries. I just got what might be the last three eggplants grown by Imwalle Gardens. That means epplant is OVER. 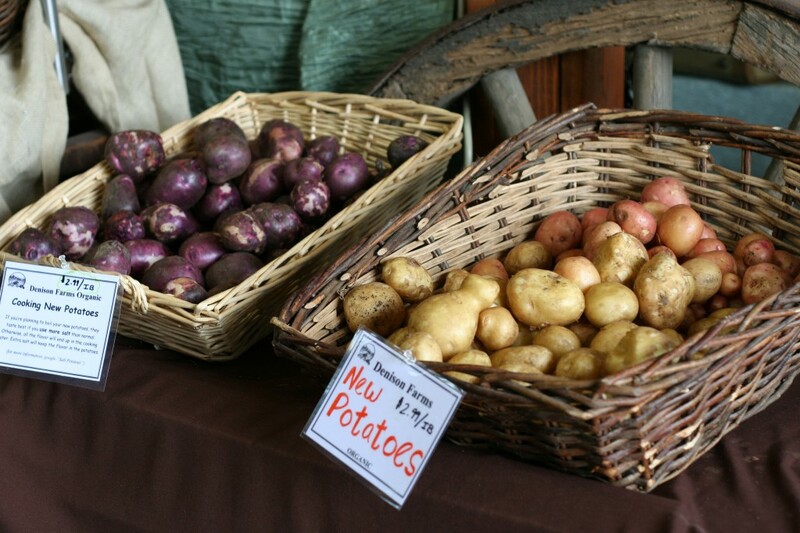 I don’t buy them out of season so when you can’t get them locally grown any more it means no more for a long time. I have wanted to make this eggplant dish for a long time but it requires you to shallow fry the eggplant – I’m not big on frying and I could probably broil them but I want my first time trying this dish to be as rich as the recipe is – because the last time you eat fresh eggplant for a year deserves to be special. The stuffed peppers is a vegan dish I have been wanting to experiment with. I haven’t ever tried such a thing and I don’t have any recipe for it. I do have a recipe for the cashew cream sauce. My friend Sid made the most amazing spaghetti squash dish that was like a lasagna with layers of squash, marinara sauce, tofu, and then topped with a cashew bechamel. The bechamel was wonderful! So it’s time to play with creamy vegan sauces. This entry was posted in Around the Farmhouse and tagged drying figs, foraging, foraging for food, foraging walnuts, homesteading projects, local eating, local food, lye cured olives, menu plan, pickled habaneros on November 14, 2012 by angelina. 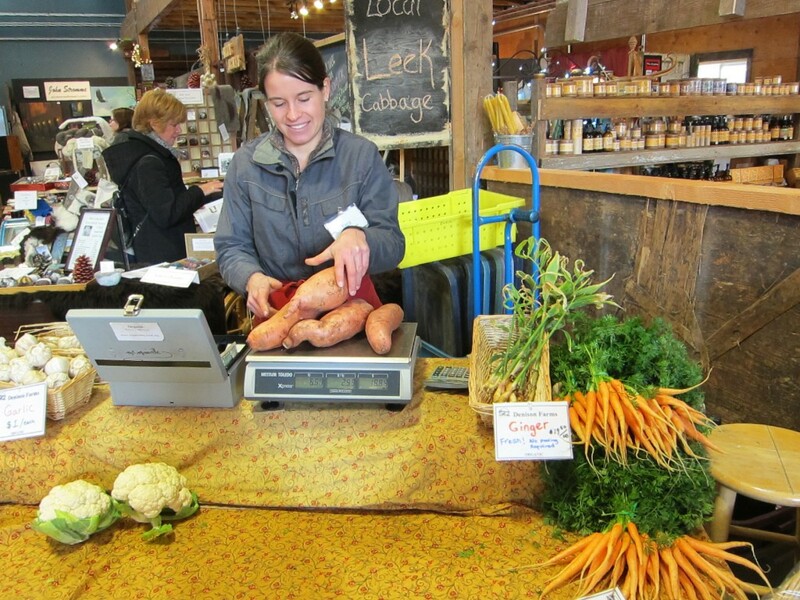 This is Tara from Denison Farms weighing my ENORMOUS sweet potatos. 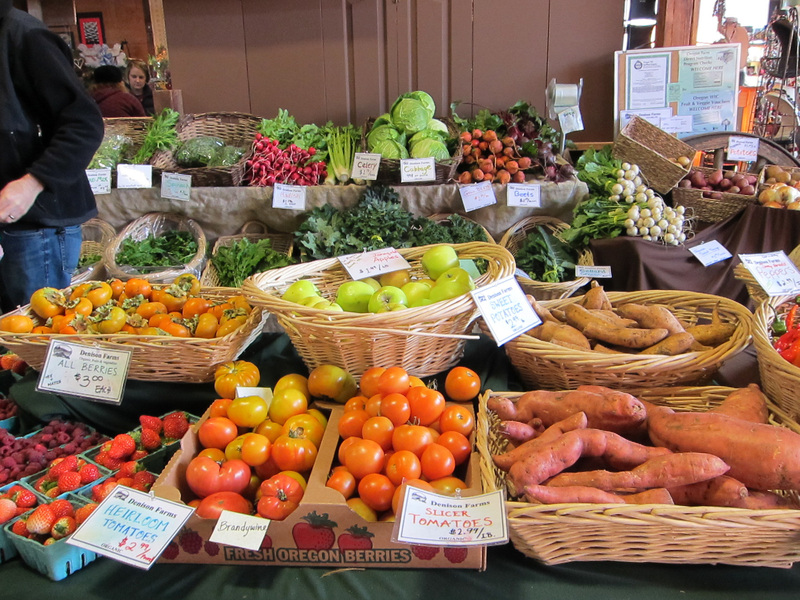 I go to the McMinnville Saturday Market every weekend to buy my produce for the week. There are two produce vendors there: Growing Wild Farm and Denison Farms. Growing Wild sells out early so I often don’t get much from them. I have a horrible tendency to sleep in on Saturdays. Between the two farms (both certified organic) I manage to buy about 90% of the produce I use each week. When I talk to people about eating locally and seasonally people ask about both the expense of it and the difficulty of cooking with so few ingredients. Few ingredients?! Check out what I find just at Denison Farms alone! Please do not buy out of season tomatoes. Look at all the other amazing things they have to offer that ARE in season! This week I spent $43 dollars and this is what I got: 4 enormous sweet potatoes, 2 giant leeks, 2 heads of cauliflower, big bag of potatoes, 2 bags of prewashed lettuce mix, 1 bunch cilantro, 4 heads of garlic, 2 bunches of collards, 1 bunch of celery, and 2 yellow onions. That will get us through a week of excellent vegetable eating. When I got home I made potato leek soup and a pan of roasted sweet potatoes, fennel (from last week’s purchase), garlic, tofu, and potatoes. That was dinner and it was amazing! How I shop: most people I know decide what food they’re going to make and then go to the store to buy the things they need. When you shop farmer’s markets you need to do the opposite; go to the market to see what’s available that looks good to you and then figure out what you will do with it. You don’t need to know the exact amounts needed for recipes ahead of time. Generally speaking you won’t need more than one head of cauliflower per cauliflower recipe. One bunch of collards is generally enough for anything it’s going into. If you’re not used to shopping this way it may take a little getting used to, but I’m the queen of anxiety (I have trouble with changes in routine and I get very set in my way of doing things) and even I hardly needed to adjust to this. It’s actually a much more pleasant way of shopping and planning meals. It’s also the way people have been doing it for thousands of years up until after World War ll. You cooked what what was available and in season or in your pantry – no one decided ahead of time what they would be cooking because they didn’t have access to whatever they wanted all year long in a store. 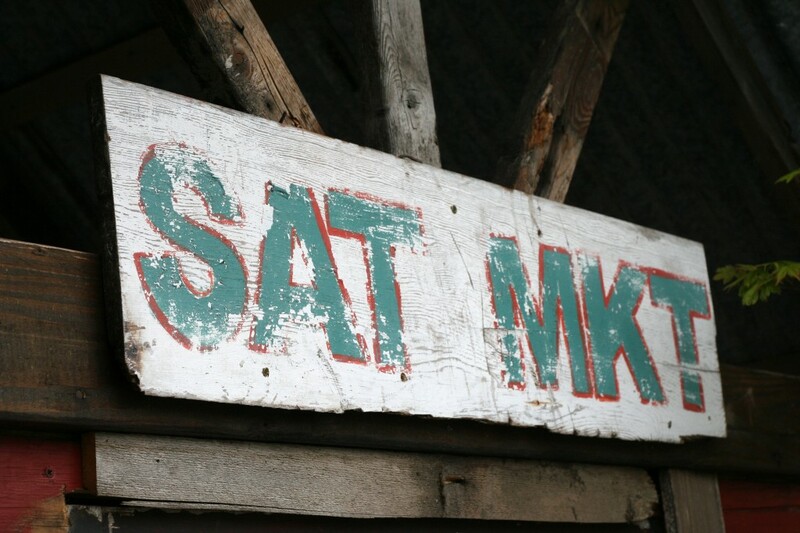 Food stores were a lot less stable. 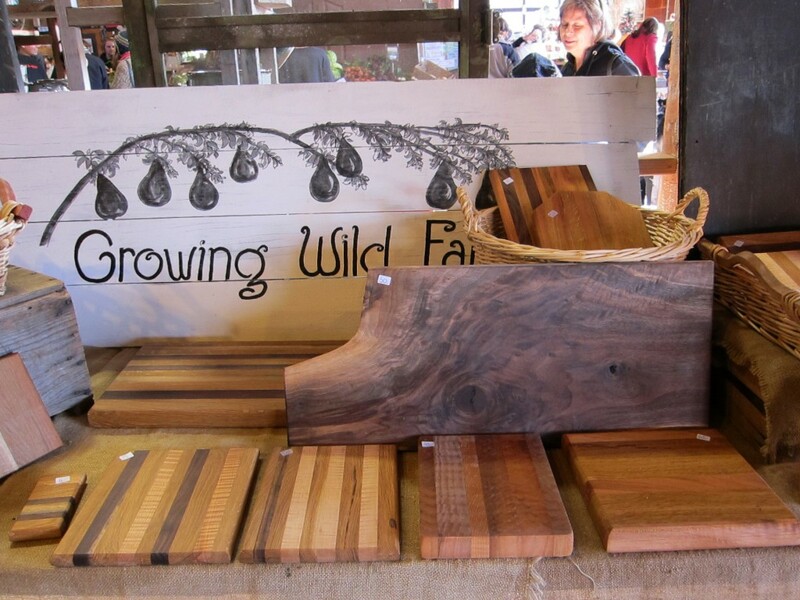 Please consider getting one of these gorgeous cutting boards from Growing Wild Farm! I have two of them and they are well made by farmer Andre from white oak fallen on his own property as well as walnut and other woods from his friends. The rustic board in this picture is new and Andre says it’s not suitable as a cutting board but is meant to be a serving board for things like cheeses. I covet it! 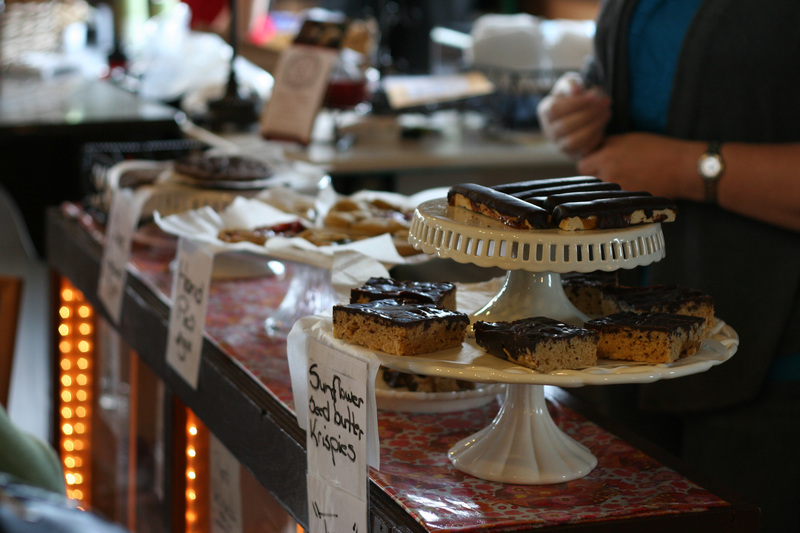 There are a lot of other things at our Saturday Market: duck eggs, chicken eggs, meat, teas, spices, some packaged spreads, honey, bread and pastries, sometimes wild mushroom vendors, chocolates, hand made soaps, used books, art, crafts, vintage clothes, jewelry, knitted goods, sometimes flowers and hand carved spoons. 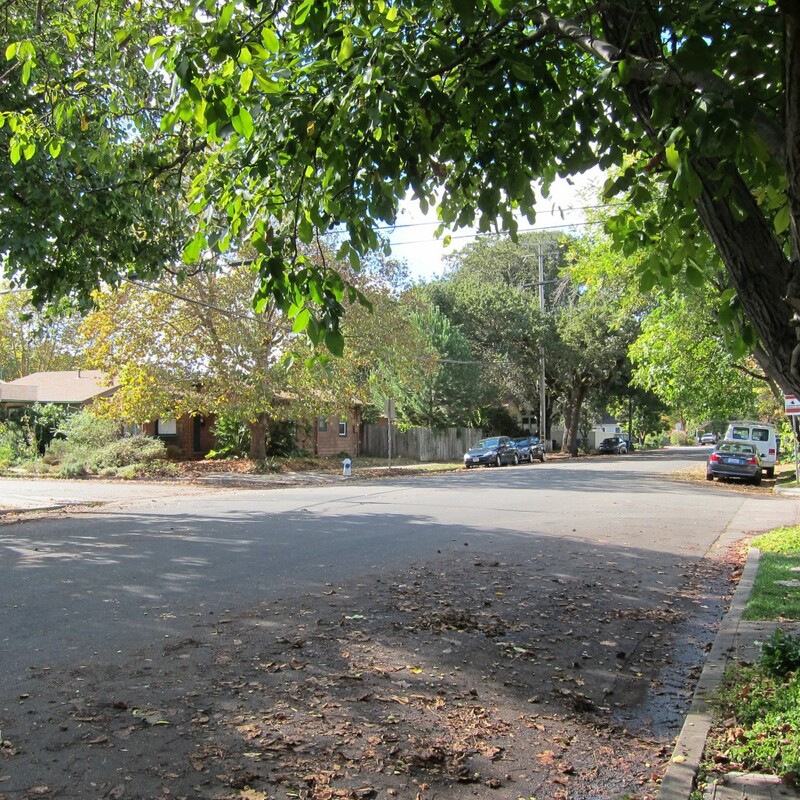 It’s becoming better and better all the time and I want my community to support it more strongly. It’s such a pleasant way to do some of your food shopping every week. It goes all year round and has made my town so much better. If you have a similar market, especially one that goes all year round, be sure to support it. 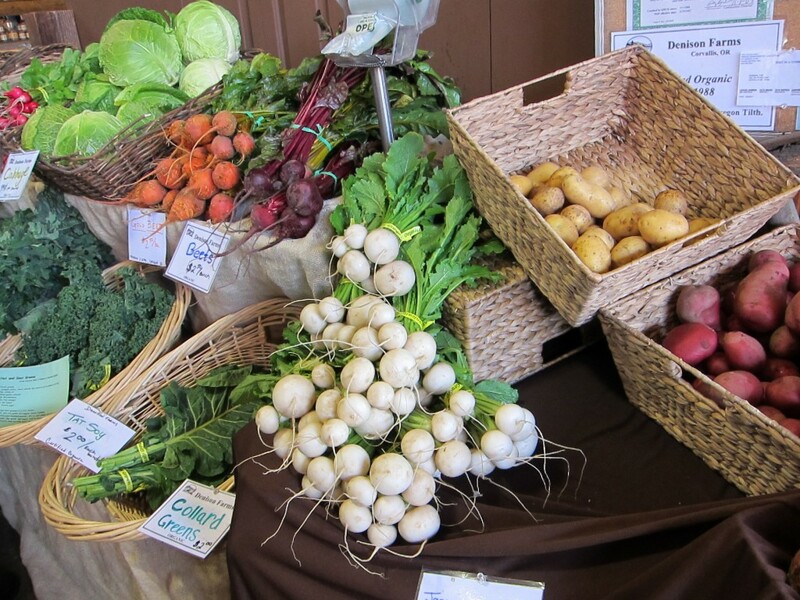 Even if you can’t afford to buy all your produce, meat, and eggs from local sources, set aside a small portion of your budget to spend on at the local market. Every dollar you spend locally makes your community economy stronger, your local food security stronger, and you are directly supporting your neighbors. Most of my readers here at Stitch and Boots already support their local food producers as much as they can. 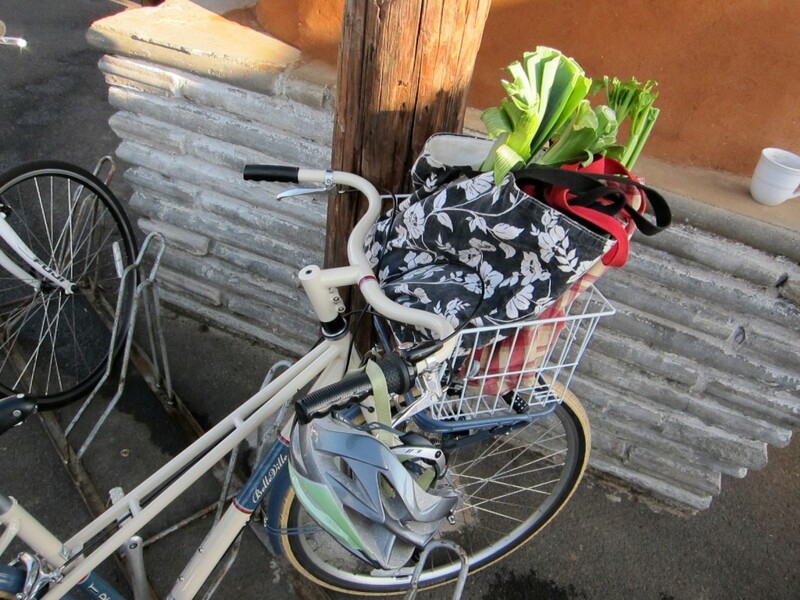 I am writing these things because if there’s even one person who comes along who doesn’t already shop their local farmer’s market that can be inspired to? WIN. Coming up soon – I’ve got a couple of recipes and will start costing out some of them to show what the food I eat actually costs. This entry was posted in Food Matters and tagged Denison Farms, eat local, Growing Wild Farm, how to shop the farmer's market, local eating, local food, McMinnville Saturday Market, supporting local farmers on December 4, 2011 by angelina. 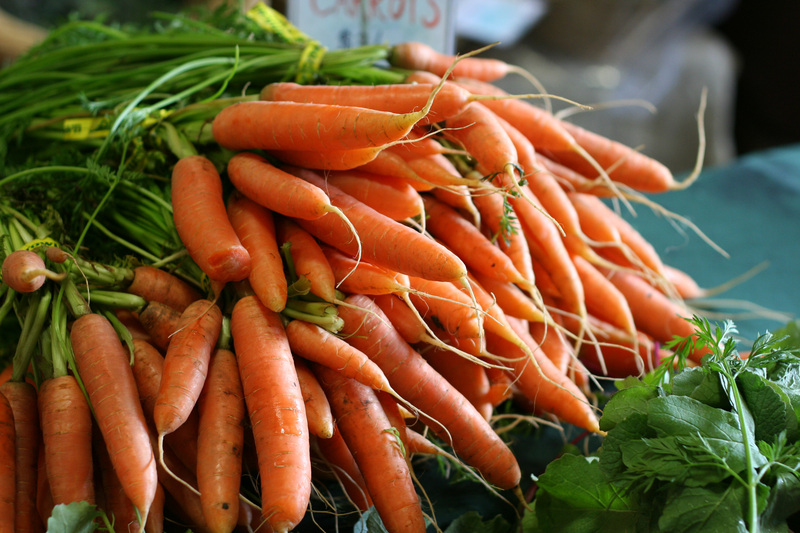 The Saturday Market in McMinnville runs all year long, unlike our week day farmer’s market that only runs from June through October. This has been fantastic for me because I try to eat mostly local and mostly organic food and the winter, before this market, was especially tough for me to stick to my preferred way of eating. There are only two farms that kept up stalls all winter long. 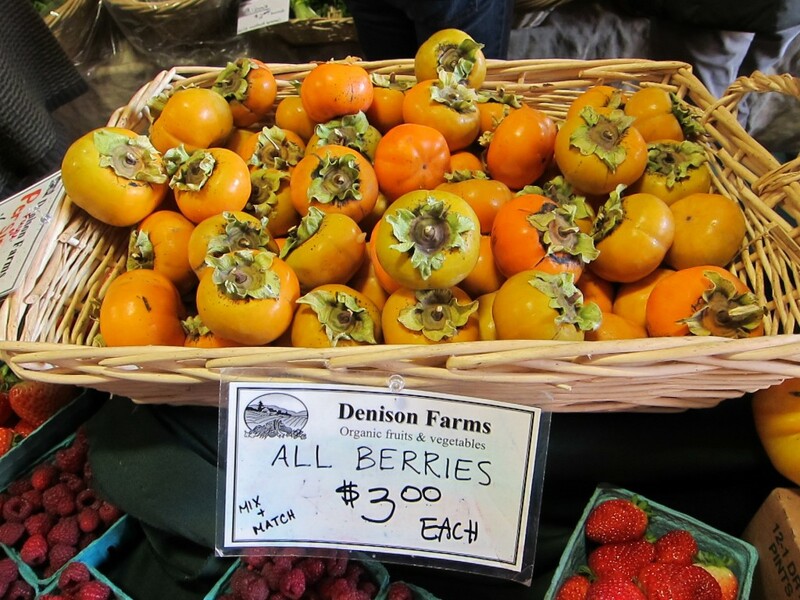 Denison Farms is a really huge farm in Corvallis that does several different farmer’s markets and this is the smallest one they do. This means that they will only keep coming if it is profitable enough. I promised myself to shop their stall every single weekend during the winter. I only missed a couple. 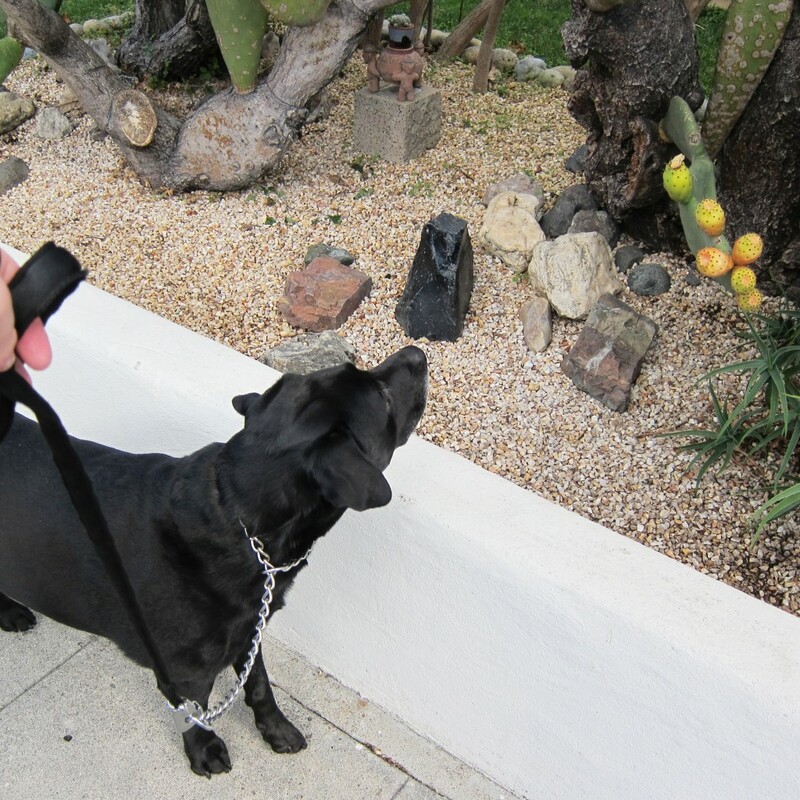 They have had a surprisingly good diversity of vegetables throughout the winter. They make use of greenhouses for certain, but this doesn’t bother me at all. If I had a big enough property I’d have a big greenhouse myself. They’re organic which is great. Their prices aren’t cheap, but it’s been a long time since I have made food choices based solely on price. We have made the choice to spend less money in other areas of our life so that we can buy good quality food. 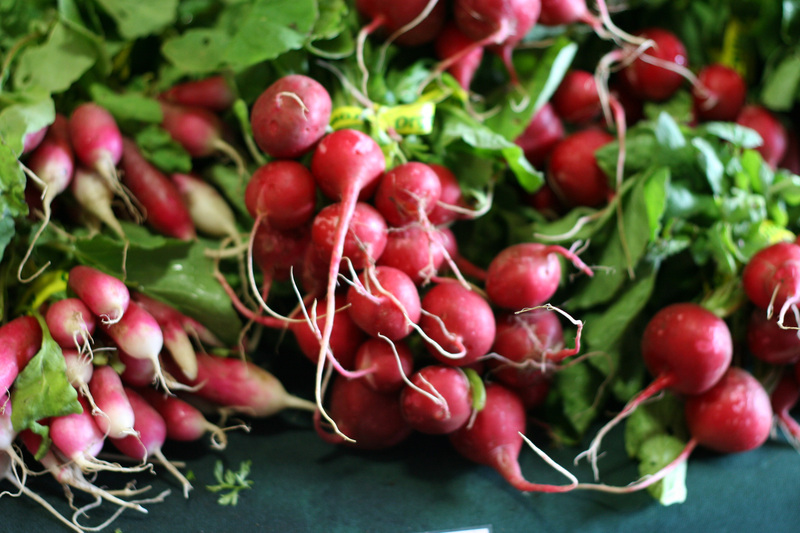 We have eaten well all winter on the most lush dark greens and on their fennel, turnips, carrots (sometimes), leeks, potatoes (until they ran out of last year’s crop), and radishes. I’m not a big fan of radishes but I’m learning to enjoy having them in salads. Just don’t ask me to eat them whole dipped in salt and butter. (Excuse me while I retch that thought out of my head.) In spite of not loving to eat radishes, I have to admit that I think they’re beautiful and I never get tired of seeing them stacked up. 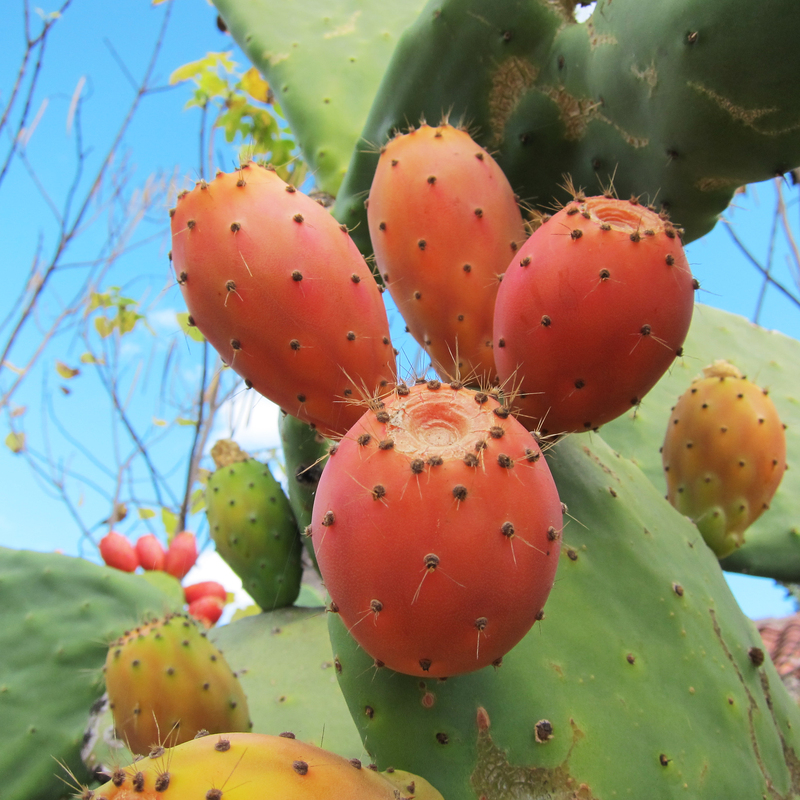 Growing Wild Farm is also organic. It’s a small family owned farm here in McMinnville. They had some good offerings for most of the winter but when it got slim at last, they brought out the cutting boards they make from fallen oak trees on their property. 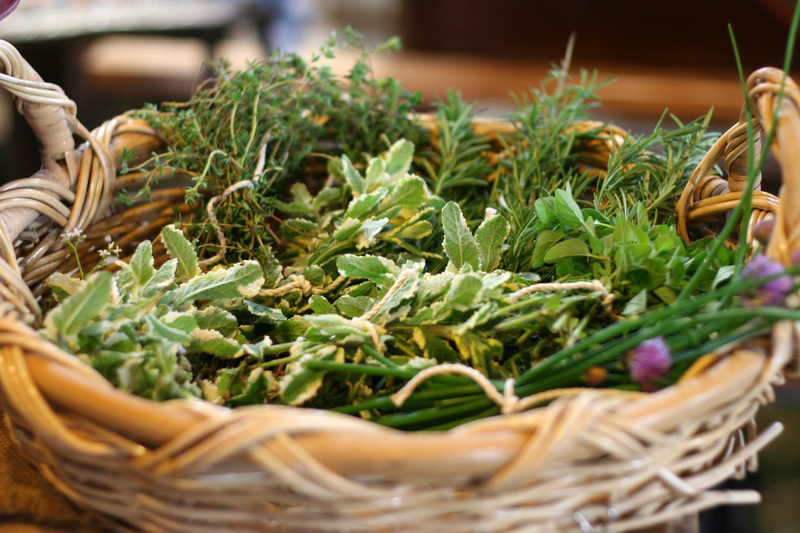 They are also one of the few farms that offers fresh herbs. I find it curious that so few farms here do that. Basil is about the best you can find around here. 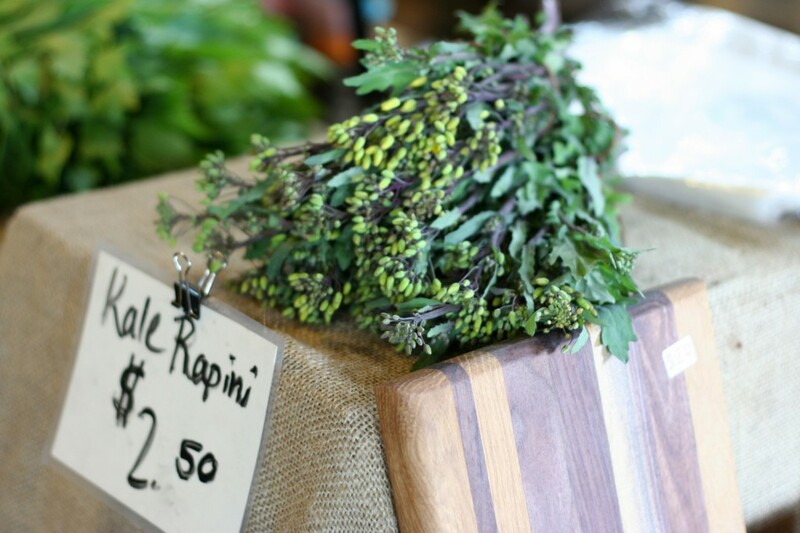 Growing Wild offers lovage, sage, rosemary, mint, and sometimes dill. I’m not a big fan of rapini. I want to be. Just like with the radishes. I don’t hate it. There are honestly few vegetables that I hate. But I never choose rapini if I can choose something else. Still, it’s popular and it’s pretty. See that cutting board? Next picture shows more of them. I bought two of them this year and I LOVE them! I am notoriously hard on everything I use. I have never waxed a cutting board in my life until I bought these handmade ones. They’re gorgeous and sturdy and I’m trying to take good care of mine. 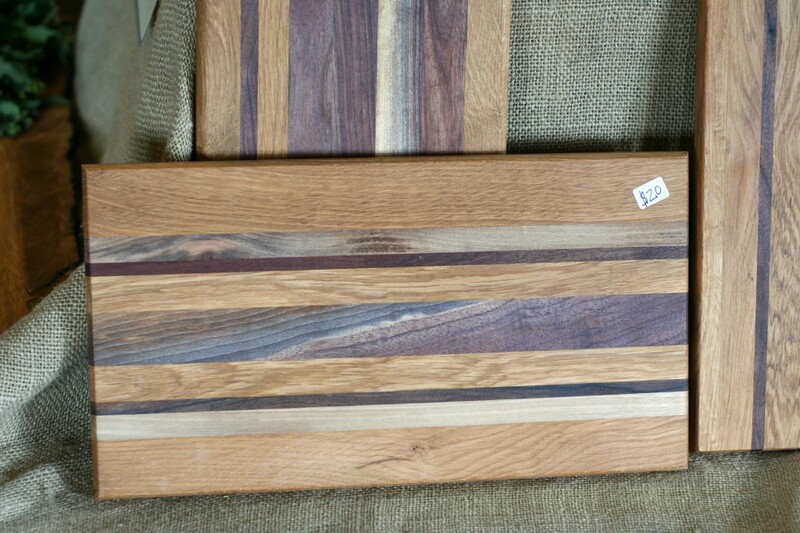 Next time you need a cutting board you should come and check these out. Sometimes if you have a specific cutting board size you need and it’s not there Andre will make one to the size you need. Always be sure to ask. Ruby Cakes is new this year. My friend Dominique started this business baking allergen free cupcakes and other baked goods. She now has a partner whose name I have shamefully forgotten. (I only met her once!) The business has been doing very well and even my picky son likes the cupcakes. Every weekend it seems they have some new treat for everyone to try. I can’t keep up with everything these treats are free of but here’s what I know for sure: gluten free, dairy free, and soy free. They also offer some sugar free treats. 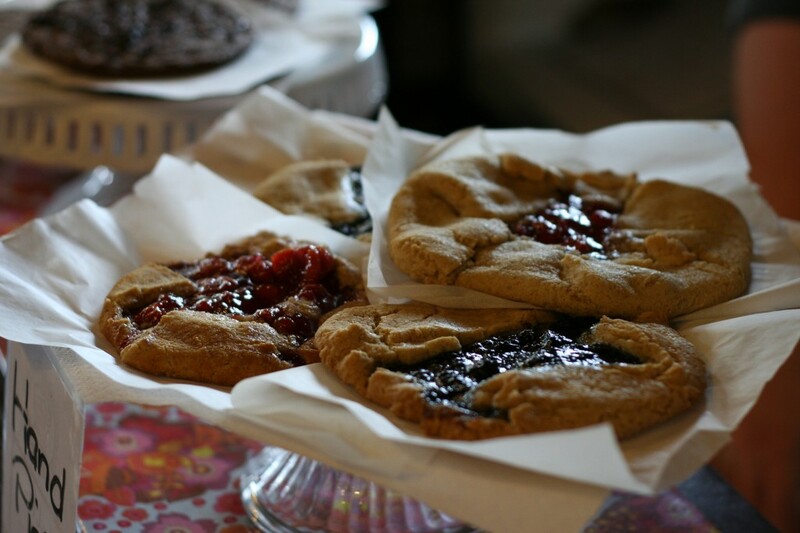 Red Fox Bakery is also at the Saturday Market. They have a counter inside where you can buy breads and pastries and the best macaroons in the entire world. Outside they make pizzas in a cob oven which are also very good. 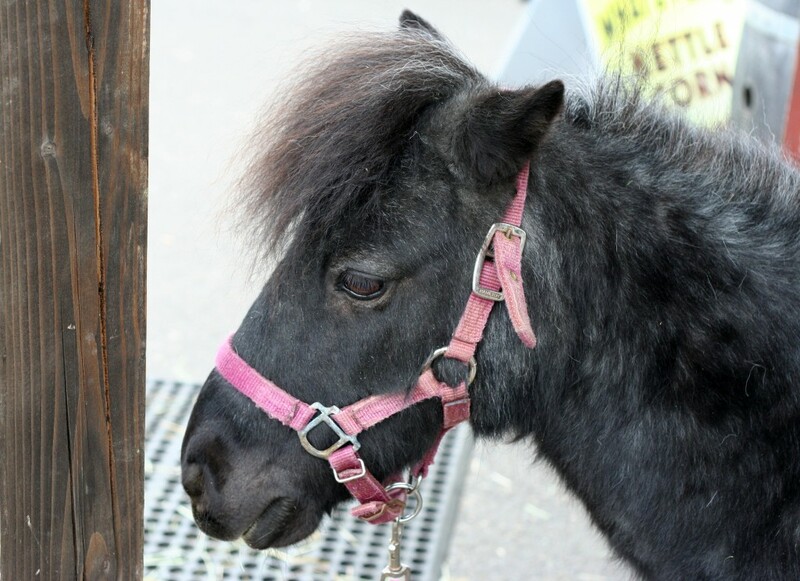 This miniature horse is a new attraction at the Saturday Market for the kids. I’m a sucker for animals and can’t get over how small this horse is. Maybe it’s really a pony? I don’t know, but he’s cute. 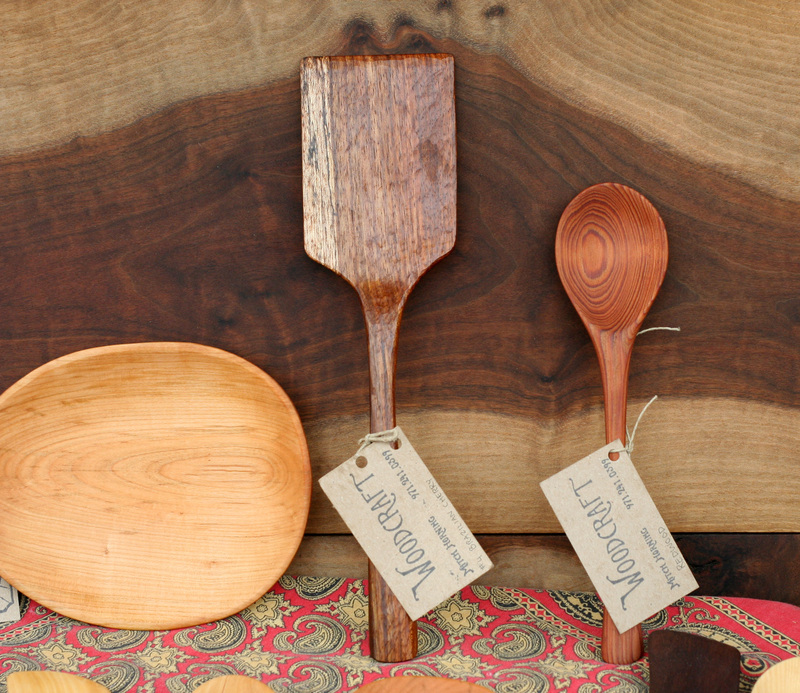 Another recent addition to the Saturday Market is a stall full of handmade wooden spoons, bowls, and terrariums. 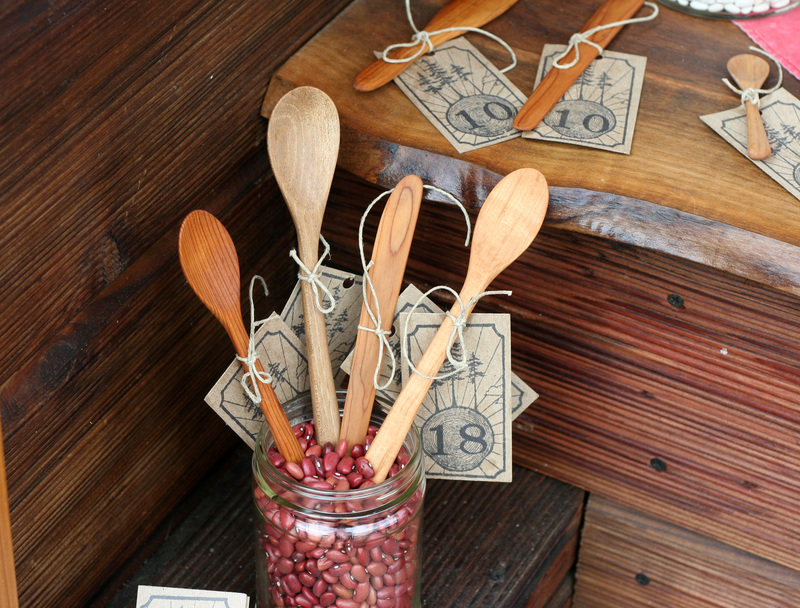 The day I took these pictures there were no terrariums so feast your eyes on the spoons! This stall is run by Mitch and Ari (Mitch does the woodworking and Ari does the terrariums). I have been in need of wooden spoons recently. I lost the two I’ve been using for years. I’m not sure a kitchen can have too many spoons. I bought two cheap ones from the kitchen store downtown but that was before I saw these ones. They aren’t cheap but they’re gorgeous and worth every penny. Wooden spoons can last forever. No lie. There is no comparison between the ones Mitch makes and the cheap factory made ones. Each spoon is different, he uses a variety of woods, so you have to test each one out to see how it feels in your hand, does the depth of the bowl please or do you want something shallower? Is the handle the right thickness, does it taper where you want a handle to taper? You don’t actually have to ask these questions like a dork. You just pick up different spoons until you’re holding one that makes you want to rush home and start a pot of soup. I bought a long handled spoon for soup but plan to buy a shorter handled one with a deeper bowl as soon as the budget allows. These little walnut buttons completely charmed me. 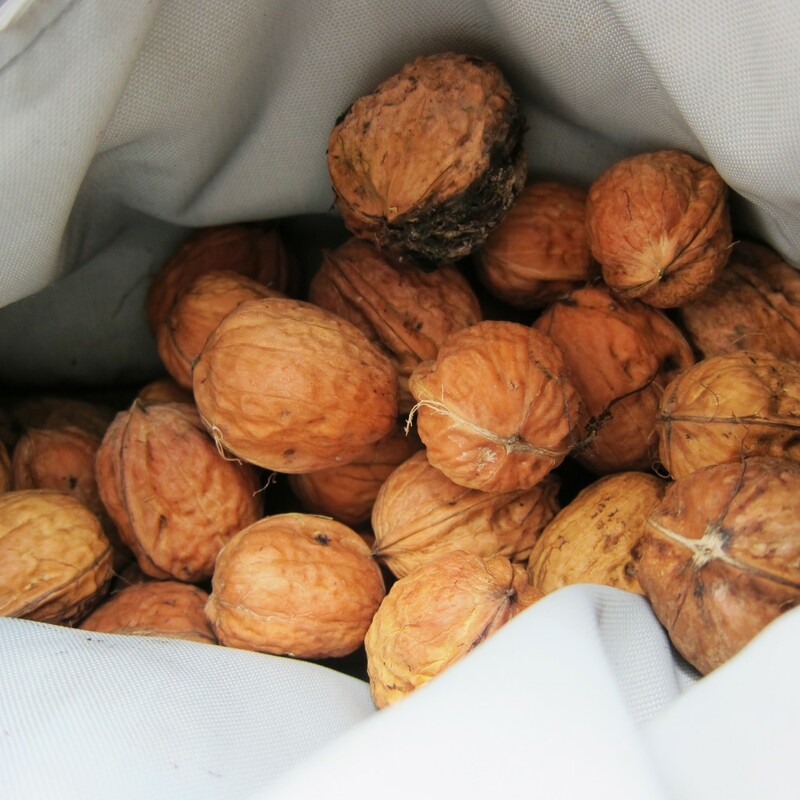 For my book I was wondering what my character Cricket would do if she couldn’t get hold of containers for lip balm and I thought of walnuts with little hinges on them, sanded out inside, filled with balm, and closed with some twine. When I saw these I was amazed to see that someone else had thought of something to do with walnut shells- I hadn’t considered that they could be used as buttons! Other things you can get at the Saturday market: jewelry, soaps (sometimes), wild mushrooms, duck eggs, other baked goods, crafts, chocolates, knitted hats and scarves, and nursery plants and bulbs. 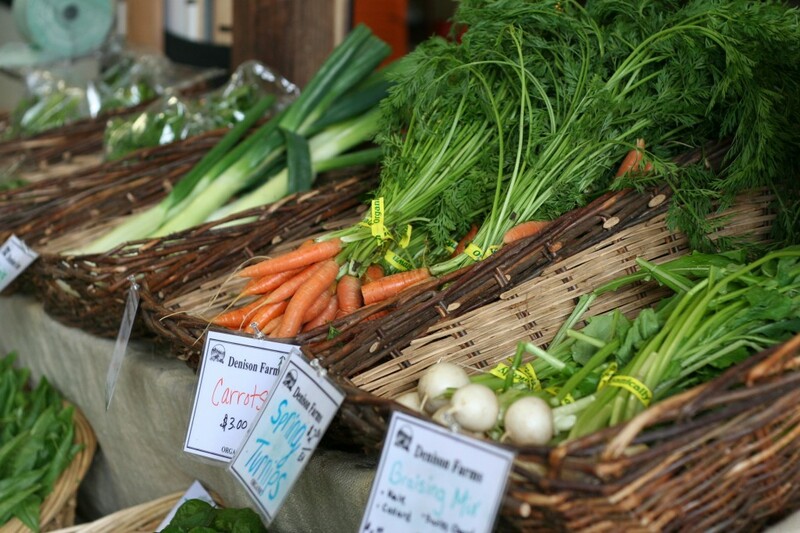 Not all of these things are there all the time but if you haven’t visited the Saturday Market and you live in McMinnville, you must come and see it! I think every community needs a market like this year round. This entry was posted in Around the Farmhouse and tagged local crafts, local farms, local food, local market, McMinnville, McMinnville Saturday Market, Oregon, Saturday Market on May 28, 2011 by angelina.